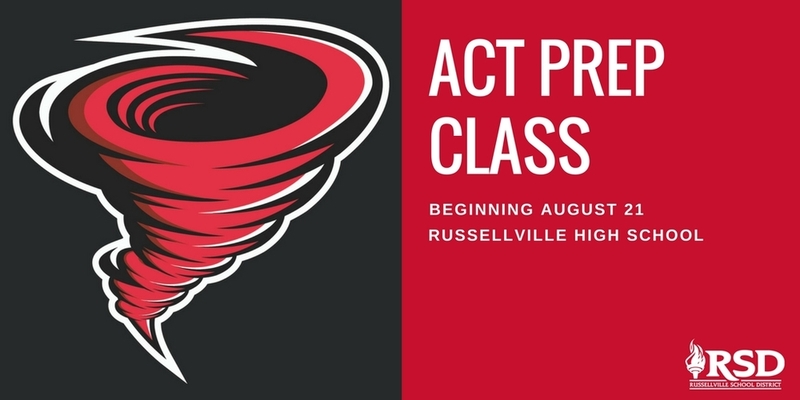 There will be a free ACT preparatory class from 6-8 p.m. every Monday beginning on August 21 at Russellville High School. The class is open to 2017-18 ninth, 10th, 11th, and 12th-graders who attend Russellville School District. All RHS 11th-graders will be given the opportunity to take a free ACT test during the school week in the spring semester. All materials will be supplied for the class. The purpose of the class is to teach new test taking strategies, to help students avoid remedial college classes, and to improve their test scores that may qualify them for scholarships. For more information, please contact Mr. Bruce Conley at bruce.conley@russellvilleschools.net or Ms. Janet Winn at janet.winn@russellvilleschools.net.